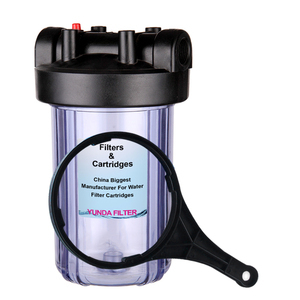 while opaque Filter Housing uses PP as material. Thicker housing and rib design can withstand much pressure. (3): Thicker walls and rib design for increased strength. (4): Max. 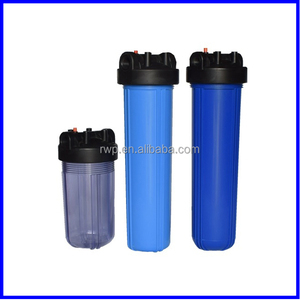 10'' 20'' clear jumbo filter housing Features & Benefits High quality PP and AS material in conformity with FDA standard; Thicker housing and rib design can withstand more pressure; Opener, air release button, brass thread fitting and more options; Technical specifications Max. Pressure: 8bar (115psi) Failure test pressure: 30bar (435psi) Cycle test pressure: 0-115psi, 100,000 cycles Recommended pressure: &lt;6bar (88psi), 25&deg;C Max. 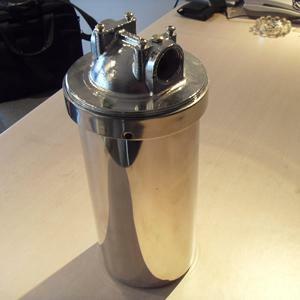 Temperature: 50&deg;C Flow rate and pressure loss depend on filter elements type; Warning: Don't expose filter housing to sunshine; Inlet/Outlet thread: Plastic, brass insert Port size: 1/4'', 1/2'', 3/4'' Inlet/Outlet thread: Plastic, brass insert Port size: 1/4'', 1/2'', 3/4'' Inlet/Outlet thread: Brass insert Port size: 1/2'', 3/4'' Inlet/Outlet thread: Plastic, brass insert Port size: 1/2'', 3/4'', 1'', 1 1/2'' After-Sales Service Frank Zhang Shanghai Minipore Industrial Co.
Fast delivery PP plastic filter housing pleated filter cartridge jumbo Slim/Big Blue filter housing 10"/20"
Wuhu Ecotech Trade Co., Ltd.
Air is transferred into the water, mixing the media and water and providing oxygen to the bacteria. The biofilm absorbs, oxidizes and reduces organic and inorganic material thus providing treatment. 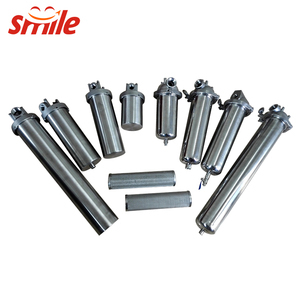 We will supply with the best serive, High quality, the fairest price for our customer. Failure test pressure:30 Bar (435psi) C. Recommended pressure:&lt;6 Bar (88psi),25&deg;C E. MAX. Pressure: 10bar (145psi) Recommended pressure: &lt;8bar (115psi), 25&deg;C Max. 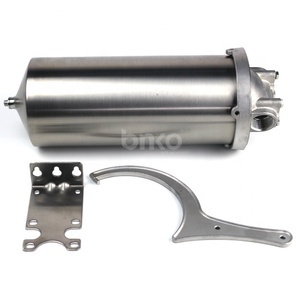 Alibaba.com offers 391 jumbo filter housing products. 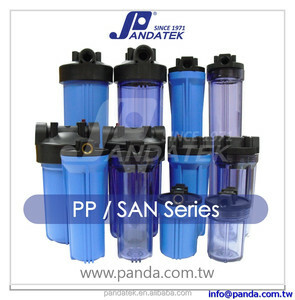 About 49% of these are water treatment, 27% are water filters, and 18% are water filter parts. 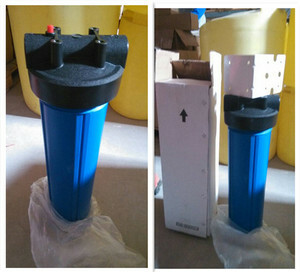 A wide variety of jumbo filter housing options are available to you, such as free samples, paid samples. 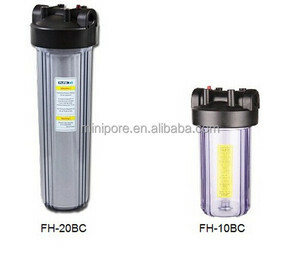 There are 392 jumbo filter housing suppliers, mainly located in Asia. 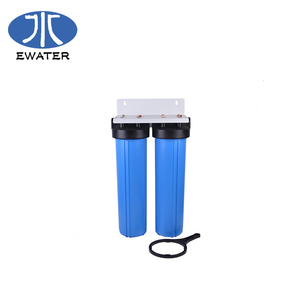 The top supplying countries are China (Mainland), Taiwan, and India, which supply 95%, 2%, and 1% of jumbo filter housing respectively. 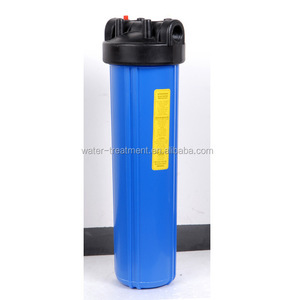 Jumbo filter housing products are most popular in Mid East, Africa, and North America. You can ensure product safety by selecting from certified suppliers, including 99 with ISO9001, 16 with Other, and 6 with ISO14001 certification.